It’s exciting to think that the 1st ever World Summit on the Digital Built Environment will take place in Helsinki next year and this week’s ReCoTech 2017 the official side event of Slush is a step on our journey to that event. The industry is just beginning to sketch out the digital built environment and to consider what it will look and feel like. At the same time that this is happening, the Bank of Finland and the Finnish Ministry of Finance are forecasting that the platform economy will be 30% or more of the Finnish Economy by 2030. The digital revolution will and already has enabled us to focus much more on the building’s end user and not just to offer solutions for the technical systems of a building. The change that is happening is being driven by a number of factors such as a worldwide trend for people to want a better work-life balance and the new business models that make up the platform economy. All of this is being accelerated and enabled by digital tools such as IoT, smartphones, online booking platforms and virtual work tools such as Skype. As we move more and more from the scale of the building to the scale of the city our focus moves from the end user of a building to the citizen of a city. At this stage in the development of the real estate and construction industry we feel that the most important task is to improve the daily life of the citizen. This means helping them to be healthier or more sustainable or just saving them time or money as they go about their life in the new digitally enhanced built environment. We feel that the best application of digital technology is to provide a better user experience throughout the whole day which we call the smart work day. If we solve all of the citizen’s problems first and in doing this we motivate them to use digital tools in their daily life then all of the data to make city more useable, energy efficient and sustainable will be available. Solving any privacy issues that are created by this is also a top priority. AirBnB is often used as an example of how the platform economy is affecting the real estate and construction industries. This is because it is the world’s largest hotel chain even though it doesn’t own any buildings. The platform economy will bring the user benefit and the new revenue streams to the future city and it is up to the digitalisation players to determine fine details of the digital built environment. The citizens will want to find when the nearest tram or bus will arrive and they will want this information in real-time. They want to know where the nearest city bike station is and the current availability of bicycles or the location of the nearest desk in a coworking space. They will want to choose a nearby rooftop for their online shopping delivery drone to land on and they will also need access to that rooftop via the building’s stairs or elevators. When they leave their house to play with their kids they will choose a park based on the latest air quality data. The key question is whether or not all of these services will be accessed through separate websites and apps or whether the city’s services will be merged into one node. 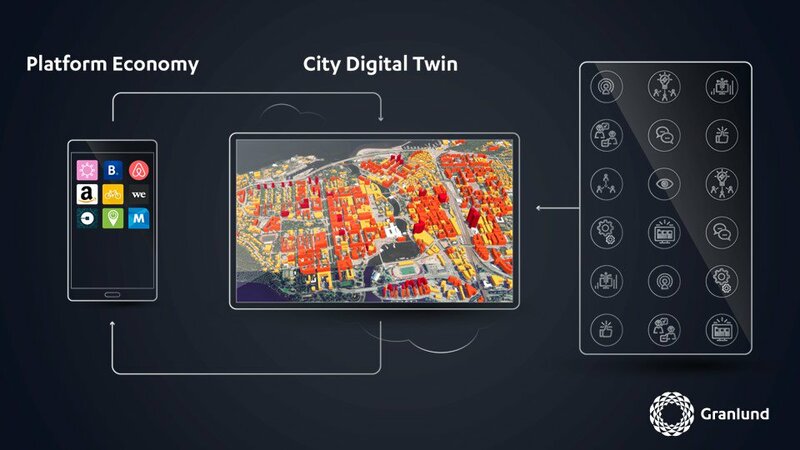 The user interface of the digital built environment could be a 3D model of the whole city and this digital twin of the city could act as the service node for the whole platform economy. We don’t yet know where the developments of the digital built environment will come to equilibrium but we will certainly have fun finding out! Ken Dooley and Tero Järvinen are speakers at the ReCoTech 2017 – official side event of Slush 2017. Their topic is ”Digital Twin – the playground for the platform economy” . Text has been published in Finnish in Locus-magazine October 2017. ← Miksi ammattikeittiösuunnittelu vaatii erityisosaamista?